Many runners know that a marathon is 26.2 miles, or to be more specific, 26 miles plus 385 yards. But how did that distance originate? In a nod to Greek history, the first marathon running event at the inaugural Olympics in 1896 commemorated the story of Pheidippides, a soldier who reportedly ran from a battlefield near the town of Marathon, Greece, to Athens in 490 B.C. According to legend, he ran approximately 25 miles to announce the defeat of the Persians at the Battle of Marathon. Upon arriving in Athens, he announced “Niki!” (Victory!) then fell over and died. The first official marathon, in 1896, was 24.85 miles, and the course went from Marathon Bridge to Olympic Stadium in Athens. 25 entrants started and only 9 finished. The next few Olympic marathons varied in distance; the idea was that as long as all runners ran the same course, it was unnecessary to keep the distance exactly the same. At the 1908 Olympics in London, Dorando Pietri of Italy (pictured) was the first finisher, but was subsequently disqualified for receiving assistance along the route. Upon entering the stadium, he had first turned the wrong way, and then collapsed several times. The clerk of the course and chief medical examiner ran to his aid – and receiving that assistance led to his DQ. American Johnny Hayes, who had crossed 32 seconds after Petri, was then declared the marathon winner. Hayes’ time of 2:55:18.4 also set a new Olympic record. In 1908, the Olympics were held in London. A 25 mile course initially was set to begin in Windsor and finish at the newly built Olympic Stadium in White City. However, course planners received a request from the Queen, who asked that the starting line be moved to Windsor Castle so that Princess Mary and her children could watch from a window. 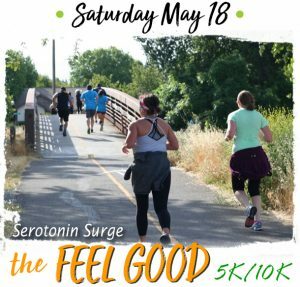 With the route change, a mile was added, and the course was now 26 miles. However, course amendments did not stop there. In order for the actual finish line to be directly in front of the royal family’s viewing box inside the stadium, an extra 385 yards had to be added to the end of the course to meet this requirement. 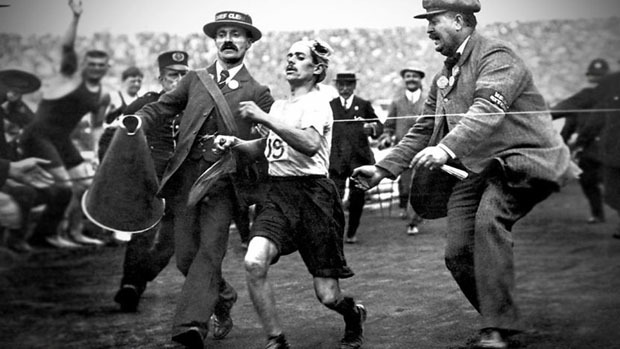 The next several Olympics saw a variety of distances for the marathon, but by the 1924 Olympiad in Paris, the 26 mile, 385 yard distance was adopted by the IAAF as the official marathon length, and it has not changed since. And there you have it! The history behind the somewhat arbitrary distance of a marathon.